The last of the 1/8-finals have been drawn to a halt and it is now clear, which 8 teams that will be represented in the Champions League quarter-finals. We take a look back at the mid week games and bring you the very best boot spots and also an update on the most scoring boots in the tournament. The four last 1/8-finals in this seasons Champions League would turn out to be very entertaining in terms of goals. A goals per game average of 3,25 is testament to the intensity of this round of football, but we are actually more interested in which boots scored the goals. 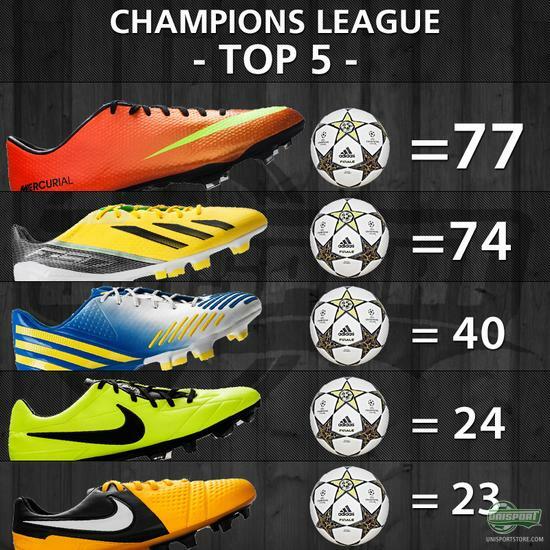 We have updated our Top 5 of the Champions Leagues most scoring boots. Adidas F50 Adizero ate up some serious ground and Nike CTR360 Maestri likewise had a very prolific round. Lionel Messi (Barcelona)  Adidas F50 Adizero Messi Red/White Custom We start of strong, with the world currently best footballer, who after weeks of media scrutiny, showed his true side. To phenomenal goals from his Adidas F50 Adizero Messi made up half of FC Barcelona's goals on a night, which secured the Catalans spot in the next round. 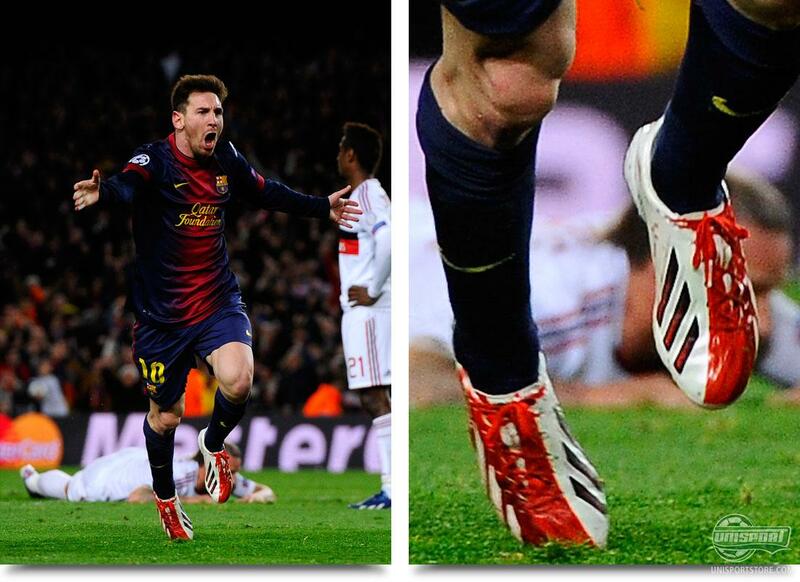 We on the night also confirmed that Messi's boots are an especially made model made from leather, which can be seen when looking at the stitching across the nose. David Villa (Barcelona)  Adidas F50 Adizero Blue/White/Purple The Spanish striker has not reached the same heights, as he did before his lengthy injury lay-off, but now things look to be moving forward for the once dreaded attacker. He curled in a wonderfully elegant goal against AC Milans Abbiati, who was left stifled by the strike from Villa's Adidas F50 Adizero Blue/White/Purple. 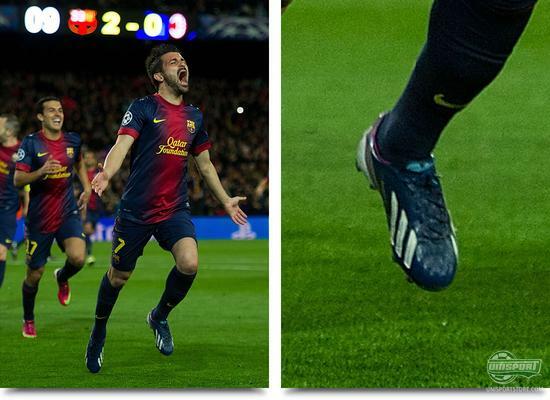 Jordi Alba (Barcelona)  Adidas F50 Adizero Blue/White/Purple It was not only a very enjoyable evening for Barcelona, but also for Adidas. All four of the goals scored in the romp of AC Milan where scored by players in Adidas F50 Adizero and this definitely also reflected in our Top 5 list. The Catalan's left back definitively closed the show at Camp Nou with the killing blow coming after an impressive box to box run in just 7 seconds. Roman Neustädter (Schalke 04)  Nike CTR360 Maestri II ACC Citrus/White/Black In Tuesdays other game was also a fiery affair, when Schalke 04 welcomed Galatasaray to Veltins Arena. It was also the home-side who started best and they could thank Roman Neustädter for that. He was wearing a a pair of Nike CTR360 Maestri III ACC Citrus, which therefore moves ever closer to the fourth spot in our Top 5 list. 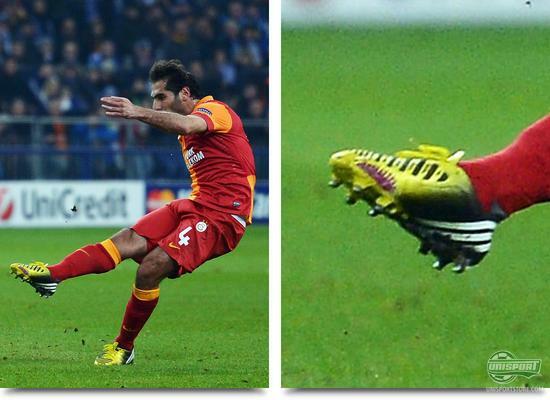 Hamit Altintop (Galatasaray)  Adidas Predator LZ Yellow/Black/Purple For the home crowd the game served as a reunion with former Schalke player Hamit Altintop. For the former fan favourite it was however not a very sympathetic visit to his old home, as he levelled the scores with his goal to make it 1-1. He did so in a pair of Adidas Predator LZ Yellow/Black/Purple, which looks to have all but secured the third spot on our Top 5. Burak Yilmaz (Galatasaray)  Nike Mercurial Vapor IX ACC Fireberry/Electric Green/Red Plum Then it was Galatasaray turn to bring themselves in front and that happened thanks to Burak Yilmaz. He has been unstoppable in the Champions League and currently shares the top spot in the official top scorers list, along with Cristiano Ronaldo, as they both have 8 goals apiece. 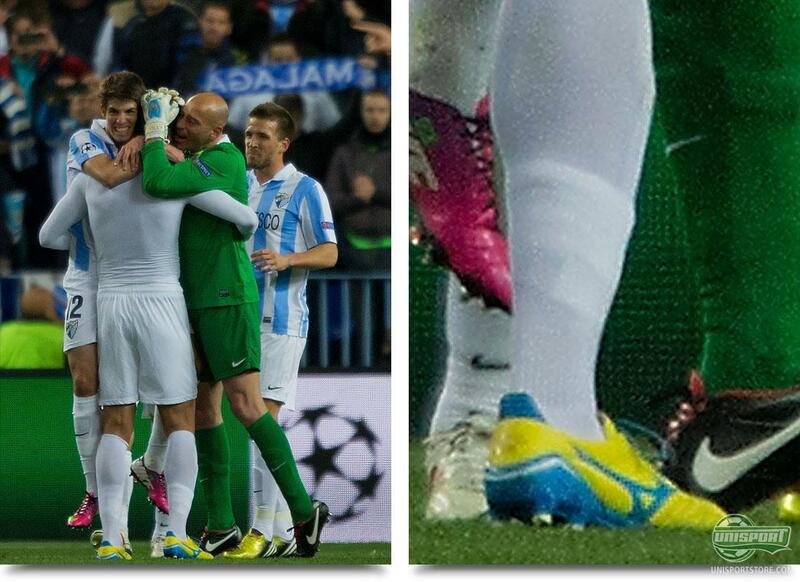 They also match each other on choice of boot, as both prefer the Nike Mercurial Vapor IX ACC Fireberry/Electric Green/Red Plum. 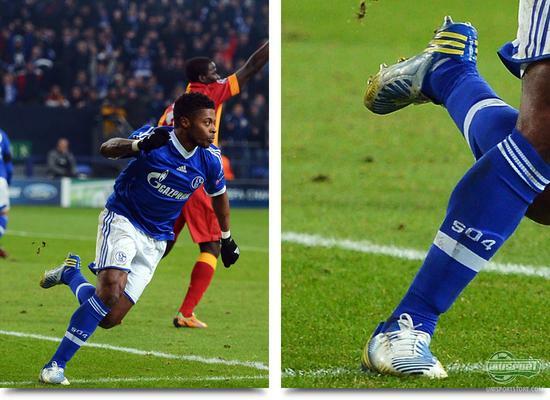 Michel Bastos (Schalke 04)  Adidas Predator LZ White/Blue/Yellow The German club from Gelsenkirchen last transfer window invested in Michel Bastos and he has so far turned out to be a good buy. He reignited the game, when he equalised to make it 2-2. 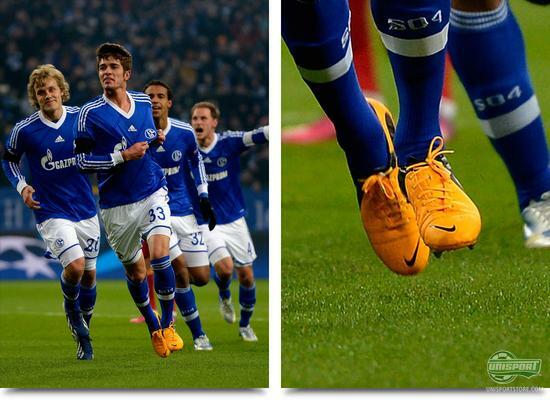 He did so in a pair of Adidas Predator LZ White/Blue/Yellow, which matches the Schalke home-kit to a tee. Roque Santa Cruz (Malaga) Mizuno Morelia Neo Yellow/Blue There has until now already been many big surprises, as well as fairytale runs, in this years Champions League, but the biggest has to be Malaga. The Spanish team managed to turn a 0-1 defeat from the previous game, to win 2-1 on aggregate. One of the goals came from the seasoned striker Roque Santa Cruz, who has moved away from the Mizuno Wave Ignitus II and over into the Mizuno Morelia Neo. Weligton Oliviera (Malaga)  Asics Lethal Shot CS 3 Blue/White We also spotted the Spaniards captain in a pair of boots, which are sure to turn a couple of heads. Weligton had hopped in a pair of Asics Lethal Shot CS 3 in Blue/White, which really stand out on the pitch. The Japanese brand Asics will soon be making a comeback here on Unisportstore and if you're interested we can tell you that there's plenty to look forward to. Isco (Malaga)  Nike Mercurial Vapor IX ACC Sunset/Volt/Total Crimson One of the biggest talents in Europe right now has to be the Spanish player Isco, who won the 2012 'Golden Boy' award. He continues to impress at the highest level and also managed to score, when Malaga edged out FC Porto in the Champions League. Malagas number 22 was wearing his Nike Mercurial Vapor IX ACC Sunset/Volt/Total Crimson, which contrast nicely with the stripy home-kit. Kieran Gibbs (Arsenal)  Adidas Predator LZ Blackout Ahead of Wednesdays 1/8-finals we kept an eye on Arsenals training and here especially one man caught our attention. It was the left back Kieran Gibbs, who normally plays in a pair of Nike Tiempo Legend IV, but before the game against Bayern Munich he trained in a pair of blackouted Adidas Predator LZ. Could the German brand be out to capture the signature of the talented Englishman? Olivier Giroud (Arsenal)  Puma Evospeed 1 Green/White/Blue The Gunners needed a miracle at the Allianz Arena, as they arrived there with a home defeat of 1-3 against them. 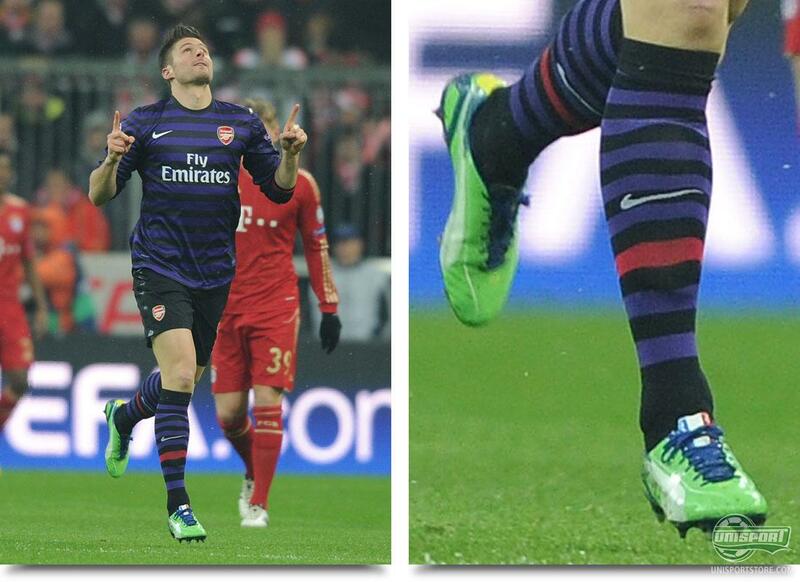 Things got of to a lightning start, who brought themselves in front after just 3 minutes, thanks to Olivier Giroud. He is notoriously slow at changing colourways and we where therefore not surprised to see him in a pair of Puma Evospeed 1 Green/White/Blue, despite a newer model being available. 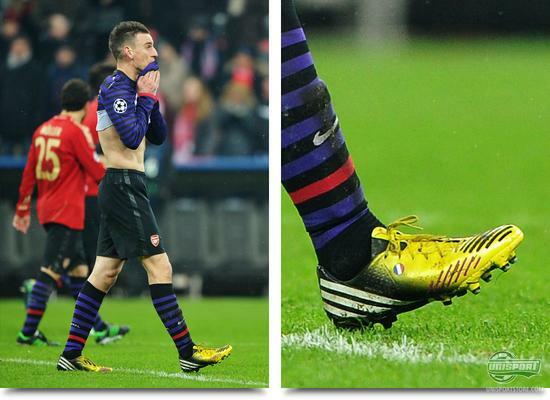 Laurent Koscielny (Arsenal)  Adidas Predator LZ Yellow/Black/Purple There were actually two French goalscorers Wednesday evening, which unfortunately wasn't enough for Arsenal. The hope was alive until the very end, when Laurent Koscielny powered home a header and made it 2-0. It may have been with his forehead he scored the goal, but we still credit the goal to his Adidas Predator LZ Yellow/Black/Purple. It was a good round of boot spots, which gave an excellent overview of the remaining teams in Europes most prestigious club tournament. What do you think of the 8 teams in the Champions league? Is your team still in it? And what do you think of this weeks boot spots? Share your comment in the box down below.